Originally published in the March 27, 2012 issue of Shelf Awareness for Readers. Reprinted here with permission.. Receive bi-weekly Shelf Awareness for Readers in your inbox by registering here. Born in 1903, Alice Herz-Sommer is the oldest living Holocaust survivor--indeed, one of the oldest women in the world. She has lived through two World Wars, one concentration camp and the death of her son. Through all of this, or perhaps despite all of this, she remains a devoted pianist and an eternal optimist, believing wholly in the power of music and laughter to bring us through the most difficult of times. With A Century of Wisdom, Caroline Stoessinger presents a catalogue of this amazing woman's philosophy, explaining Alice's banishment of the words "if only" from her vocabulary, her uncanny ability to turn disappointment into generosity and her vigilant guard against prejudice and hate within herself. 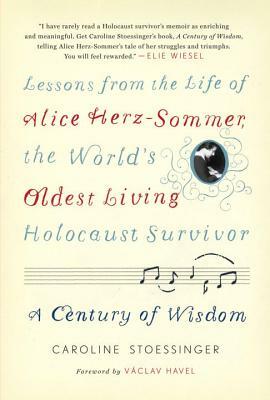 Placed in the context of Alice's life experiences, from her time in Theresienstadt to her relocation to Israel, and eventually to England, these sentiments read like miniature lessons in how to be happy despite seemingly overwhelming odds. "Only when we are so very old do we realize the beauty of life," Alice muses; while this may be true, A Century of Wisdom could be seen as an attempt to impart this wisdom to those much younger than herself. Despite the many sad stories in Alice's life, here is a message of hopefulness and happiness contained within her experiences. Alice has touched hundreds, if not thousands of lives with her music, her compassion and her character. With A Century of Wisdom, her words will continue to inspire readers for years to come.